Wicked Uncle Blog » Toddler Toys » Wonderful Wooden Toys for Toddlers – Not Plastic, Fantastic! Wooden toys are sturdy, colourful and will stand the test of time. 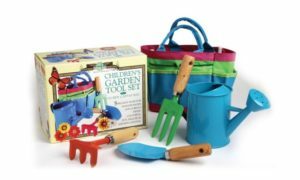 They make great presents for 2 year old toddlers and our range of wooden toys include the traditional and the innovative, so we have the perfect wooden gift for any budget or occasion. This classic wooden red 20 cm high London Bus has an upper and lower deck with five friendly passengers and the happy driver. The passengers come in a variety of colours and shapes and the bus itself acts as a shape sorting toy – corresponding holes cut in the sides help develop motor and problem-solving skills. Made by Hape, using natural, durable and sustainable materials, this is a great gift for any toddler. All aboard! This beautifully crafted wooden set is a traditional stacking game with a sweet twist. 2 year old boys and girls will love stacking the six colourful pieces on top of each other, and when completed, gently pressing on Pepe’s head and hear him woof just like a real pup! With his rotating ears and rope tail, Pepe is the perfect present to help your little ones identify different shapes and colours. Take Pepe apart and assemble him again and again – Woof! Toddlers will delight in this brilliantly colourful present. They simply let the cars go at the starting line, then watch them race and flip over one another as they come flying down the race track. The track has a sturdy wooden frame with a durable finish and painted numbers to help little minds grow whilst having fun. All three race cars come with colourful wheels and there are slots on the side to store your cars away to keep them safe. Perfect! 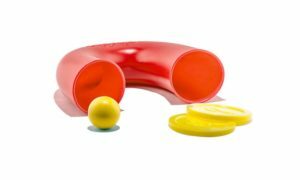 Toddlers can sing their hearts out with this 22cm, high-quality wooden microphone, with a red and blue cover. Battery-free, the clever design gives a fun amplified sound. 2 year olds love to explore rhythm and sound as they play with music, singing and listening to the different sounds made. Give this present to a budding pop star – you’re never too young to live the dream! This fantastic sturdy interactive play station has seven sides of fabulous fun, making it a popular wooden toy for 2 year olds. The top flat side features a curvy maze with wooden beads as well as a track to move a frog, duck, fish and turtle around on its top. There are six more amazing sides of new and fun learning experiences, with the moving hands clock, racing rollers, spinning gears, peek-a-boo doors, spin and match critters and, of course, alphabet blocks. Full of fun shapes, bright colours, glittery patterns and plenty of objects that spin, roll and turn. Standing 40cm high, making it great for kneeling or standing, this activity centre makes a really fun gift for any toddler. Shop the full range of toys for 2 year olds here! Rev up your Bike – Better than Noddy! PREVIOUS STORYGet Inventive – A Great STEM Toy! 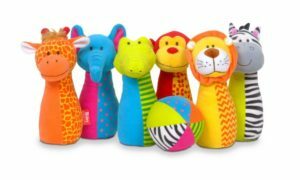 READ NEXTThe Best Bath Toys For Kids Who Hate Bath Time!